I love cooking – I really do. My fiance and I are very fond of whipping up amazing meals! However, usually there are just two of us so we have leftovers. One thing we consistently have left over is sauce – pasta sauce, salad dressing, marinades you name it we usually have leftovers! I hate to just throw the leftover sauce in the fridge in a big container because chances are it would go bad before I wanted to use it again. I didn’t want to freeze it in a big container either because I usually don’t need to use the entire amount the second time… or even third time. Ice cube trays! They are perfect for single size portioning and they are made for the freezer! Simply take your sauce fill up a tray and pop it into the freezer and take it out when you need it. I typically cover it with plastic wrap until it freezes and then remove it after it’s frozen. So go ahead and make a big pot of tomato sauce, or use the basil from your yard to make a tasty pesto and don’t feel bad if you don’t use it, simply freeze it for next time! 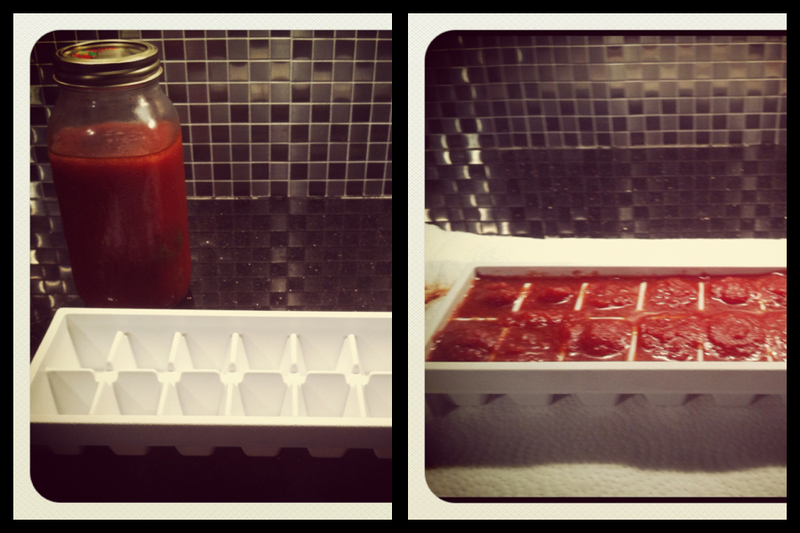 Use ice cube trays to freeze individual serving sizes for sauce, dressing, marinades or any other sauces.